What is your favorite chocolate roast? Fresco Chocolate is a chocolate maker who is transparent about their roasting process. The chocolate maker is an artist who creates flavor in many different ways. One method is the roast of the cacao bean before the beans are made into chocolate. 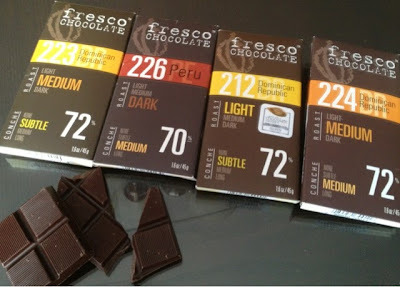 Next time you taste a fine, craft chocolate bar see if you can tell how the cacao was roasted. Was it a light, medium, or dark roast? Which do you prefer? Fresco Chocolate is a chocolate maker who is transparent about his techniques. He notes the roast level right on the front of the package. Want to talk to more chocolate makers about how they change the flavor of the bars they make? Visit the NW Chocolate Festival this weekend or stay tuned here!